Tea lovers with a taste for exotic varieties may be familiar with pu-erh tea, a brew prized for its rich flavor. Named for a city in the Yunnan region of China (and primarily produced in that region), pu-erh tea is also said to boast a wide range of health benefits. 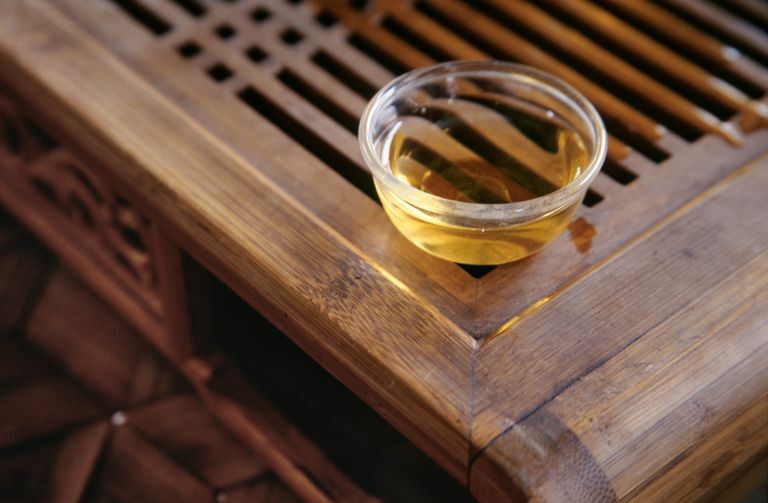 Like green tea, black tea, and white tea, pu-erh tea is made from the leaves of the Camellia sinensis plant. However, pu-erh tea is created according to a specialized process that involves a lengthy fermentation period. Once fermented, the tea leaves are aged (sometimes for years or even decades) and packed into bricks or cakes. Along with lending pu-erh tea its distinct flavor, this fermentation and aging process is said to give the tea a number of unique medicinal properties. In China, pu-erh tea has long been sipped to achieve a variety of health benefits, such as improvements in heart health and reductions in cholesterol levels. It’s also said that pu-erh tea can help promote weight loss, enhance eyesight, stimulate circulation, and soothe hangovers. In preliminary research on animals and in test tubes, scientists have observed that pu-erh tea may fight oxidative stress, regulate blood sugar levels (a key factor in diabetes control), protect against obesity, and possess anti-cancer activity. In a study published in Clinical Interventions in Aging in 2016, researchers determined that pu-erh tea may help keep cholesterol in check. After consuming pu-erh tea extract every day for 20 weeks, a small group of overweight or obese adults showed a mild reduction in cholesterol levels. Compared to participants given a placebo for the same time period, those treated with pu-erh tea extract also experienced greater weight loss and fat loss. In a study published in the Chinese Journal of Integrative Medicine in 2011, for instance, 90 people with metabolic syndrome took either pu-erh tea extract or a placebo in capsule form every day for three months. By the study’s end, those given pu-erh tea showed greater improvements in such factors as obesity, blood sugar levels, and cholesterol levels (compared those given the placebo). The study’s authors noted that pu-erh tea is "ideally fit for early prevention of metabolic syndrome." Pu-erh tea is said to contain lower levels of caffeine than other types of tea. Still, consuming too much caffeine may trigger a number of side effects, including headaches, insomnia, diarrhea, irregular heartbeat, heartburn, and dizziness. It’s also important to note that pu-erh tea should not be used as a substitute for standard treatment of any type of chronic condition (such as high cholesterol or metabolic syndrome). If you’re thinking of including pu-erh tea in your treatment plan for such conditions, make sure to consult your physician first. Chu SL, Fu H, Yang JX, et al. A Randomized Double-Blind Placebo-Controlled Study of Pu'er Tea Extract on the Regulation of Metabolic Syndrome. Chin J Integr Med. 2011 Jul;17(7):492-8. Huang HC, Lin JK. Pu-erh tea, Green Tea, and Black Tea Suppresses Hyperlipidemia, Hyperleptinemia and Fatty Acid Synthase Through Activating AMPK in Rats Fed a High-Fructose Diet. Food Funct. 2012 Feb;3(2):170-7. Jensen GS, Beaman JL, He Y, Guo Z, Sun H. Reduction of Body Fat and Improved Lipid Profile Associated With Daily Consumption of a Puer Tea Extract in a Hyperlipidemic Population: A Randomized Placebo-Controlled Trial. Clin Interv Aging. 2016 Mar 24;11:367-76. Yang TY, Chou JI, Ueng KC, et al. Weight Reduction Effect of Puerh Tea in Male Patients With Metabolic Syndrome. Phytother Res. 2014 Jul;28(7):1096-101.